Last week, we explored how Americans spend their time consuming media. Despite rumors of its death, we showed that traditional TV is still king. And today is a golden age for TV, with record numbers of shows in production (more on that in a later post). 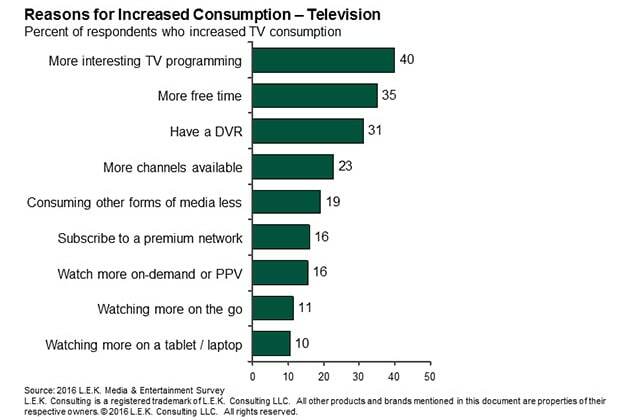 The main driver of increasing traditional TV consumption is that programming is getting better. Traditional TV companies are producing better content (think back to “The Sopranos Effect” and how so many different networks made great shows — “Mad Men,” “Breaking Bad,” “Sons of Anarchy,” “The Walking Dead” and so on — that universally raised the bar). About 40 percent of survey respondents indicated that they are watching more TV because there is more programming on traditional TV that they are interested in. Respondents also cited more free time and greater access to DVRs, which allow for time shifting. Let’s now turn to the new forms of entertainment. On the surface, reasons for increased consumption of paid over-the-top (OTT) services (Netflix, Hulu Plus and Amazon Prime) largely follow the same reasoning. Almost a third of respondents indicated that they have more free time to watch more content. Not surprisingly, the availability of on-demand content also scored high, indicating that consumers value being able to time shift their viewing in order to watch shows on their own schedules. 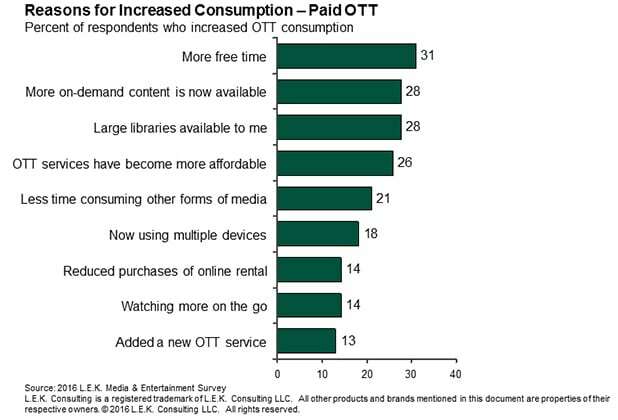 However, two additional responses popped up frequently when it came to increased use of streaming services: More than a quarter of respondents cited larger libraries with more options as a driver of their increased consumption, and another 26 percent highlighted that OTT services are now more affordable. 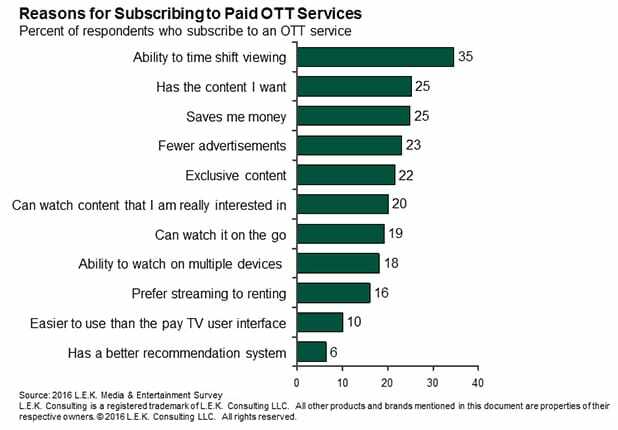 When we asked respondents why they subscribe to a paid OTT service like Netflix, the responses were even more troubling for traditional TV. More than a third of respondents cited the ability to watch content on their own timetable and not the schedule set forth by traditional TV programmers. Yet time-shifted viewing is already a feature that cable and satellite companies (MVPDs) provide through DVRs and on-demand offerings. So, despite time-shifting capabilities with traditional TV, there is still a perception that OTT services better meet the needs of respondents. In addition to that, about a quarter of respondents subscribe because they see OTT services as a cheaper option than traditional TV, and another quarter prefer the lack of advertisements. Those are two more advantages that traditional TV operators cannot match, and it is those last two responses that should worry TV players. Larger OTT libraries and better pricing are a big problem for traditional TV. Paid OTT services win on these factors, and traditional TV will have trouble matching these advantages. Traditional TV is still king for many good reasons. Better programming and increased use of time shifting has helped drive further gains in consumption. But OTT services are hot on the heels of traditional TV with their large libraries, better pricing and no commercials. Production companies, networks, cable companies, satellite companies and other traditional TV companies will need new ideas and actions to maintain revenues. Our next post will look at how these shifts in consumer viewing threaten traditional advertising. This is Part 2 in a series on television trends by Dan Schechter, Gil Moran and Michael Kaufman from L.E.K. Consulting’s Media & Entertainment consulting practice.